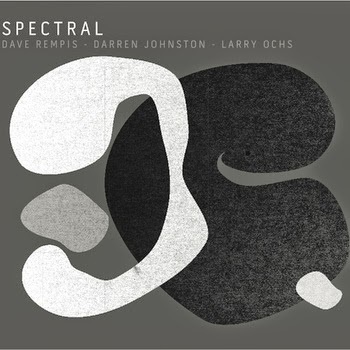 Spectral is the latest cd from Aerophonic, the label founded by Dave Rempis (alto sax), who, along with Darren Johnson (trumpet) and Larry Ochs (tenor/sopranino sax), collaborated on this session. It is a challenging and ultimately rewarding work. With no traditional rhythm section, bass and drums, the three horns create a sound that twists and turns around one another, separates and contracts over seven varied tracks. Silence is used as an active part as well, no so much providing pauses or tension but as an atmospheric element that frames the improvisations. A similar example would be Jimmy Giuffre's classic album "Free Fall," from the early 60's. Throughout the album, the interaction and use of the horns are unique and unexpected. The lead track, 'Traction', has a 'Flight of the Bumblebee' fluttering of the horns, while on 'Snaggletooth Tussle', the trumpet and horns have a call and response interaction, before tumbling into an improvised scuffle. Everything seems well placed and considered, like active brushmarks in an abstract painting. This is a fine release that grows with repeated listens.